Even if the weather outside is frightful that doesn’t mean you should pass on plans on hold for your winter party or event. Skyline Cruises knows that there are reasons to celebrate all year round and that corporate events and fundraisers still take place in during winter months. We also know that any event is made spectacular when you charter a Skyline Cruise. With the iconic New York City skyline as a backdrop, we know that your event on our climate controlled ship will be nothing short of memorable. We’ve been in the business of helping our guests plan memorable events and celebrations for more than 20 years, so Skyline wants to help you with some ideas about planning your winter yacht charter party. The first thing you should decide is what type of winter event you’re having. 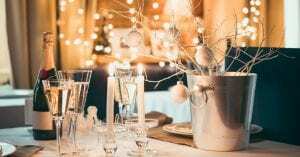 Some things you’ll know right off the bat, for example, you’ll know if its a family party, corporate event, a celebration like a bar/bat mitzvah or a fundraiser. Skyline Cruises can make all of these events happen. We do all types of corporate charters ranging from cocktail parties to formal banquets. We’re the perfect venue for all types of fundraisers, from church or school groups to not-for-profit or corporate charity events. We do charters for celebrations like sweet sixteen parties or baby showers. Our events are catered with the food cooked on board our ship. We can offer a variety of menu options and packages. Please note, that we’re expecting renovations to be done at our home port located at the World’s Fair Marina in Queens during the first quarter of 2017. Please check with Skyline for more information and the location of your departure. Once you know the basics, it’s time to figure out a theme for your party. Very often this involves a “Winter Wonderland” motif. White tablecloths, ice sculptures. Frosty blue, snow white or evergreen centerpieces and decorations. For example, white and blue balloons will give your event a winter look. Food can also help add to the winter theme of your event. Desserts with white frosting, hot chocolate or warm, hearty dishes can help make your guests feel the spirit of the season. Ask your guests to come dressed for the season in sweaters, scarfs and mittens or gloves. If your party is around the holidays, have holiday music. Or try to find music that will add to a whimsical atmosphere. The final element to your perfect winter charter is the voyage itself. Skyline Cruises will give you an opportunity to see some of the most famous sites in the world. You’ll cruise past the Manhattan Skyline, getting breathtaking views of the Empire State Building, the United Nations, and the Freedom Tower. You’ll pass under five East River bridges including the iconic Brooklyn Bridge and see historic sites like Ellis Island and of course, a close-up view of the Statue of Liberty. New York City looks spectacular no matter what season it is. So go ahead and plan that winter event. You’ll be glad you did with a Skyline Cruise. Contact us today!